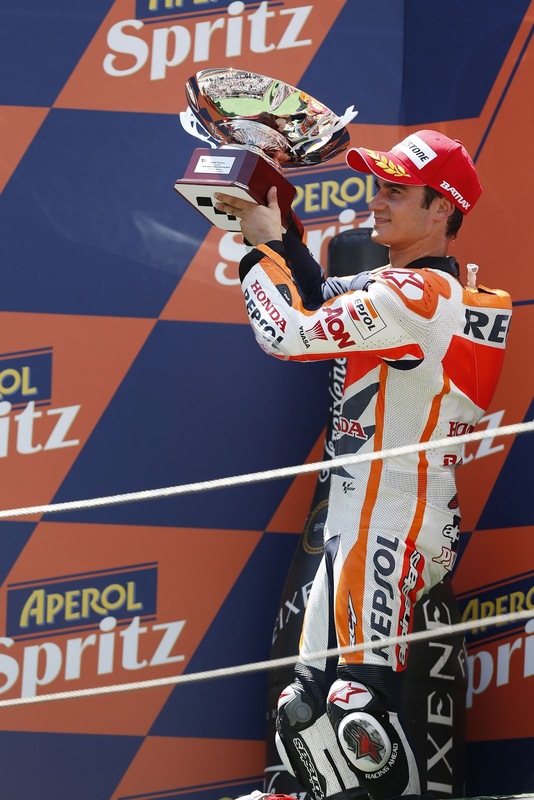 Repsol Honda rider Dani Pedrosa leaves Catalonia top of the championship standings after finishing this weekends Catalan GP in second, ahead of rookie team mate Marc Marquez. Pedrosa looked as though he was going to whitewash the competition in his 200th Grand Prix following his astounding performance in qualifying on Saturday when he broke Casey Stoner’s five year old lap record, set on old style qualifying tyres, much to the delight of his home fans. Today, however, it was very much Lorenzo’s race from the holeshot to the finish. Whilst Pedrosa and team mate Marquez followed the Yamaha rider closely for much of the race they failed to match the reigning champions pace as their tyres began to wear later on in proceedings. As Lorenzo formed a slight gap between his M1 and the pursuing RC213Vs, Pedrosa came under fire from his exuberant young team mate in the final few laps but a locked front end for Marquez at turn four on the penultimate lap gifted Pedrosa second on the podium. This means that Pedrosa now has 123 points in the championship, seven ahead of Lorenzo in second.